Morning drop off: Designated on the West side of campus only. Afternoon pick up: Parents are encouraged to pick up on West side of campus. If parents must pick up on East side of campus, parking is not allowed under the Cesar Chavez bridge. A waiting lot (similar to the cell phone lot at the airport) is available near WAYA fields until buses have left school grounds. 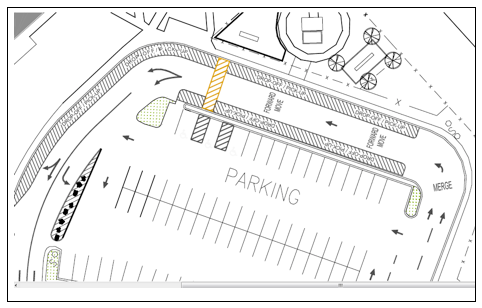 Enter staff parking lot and merge left into designated drop off/pick up lanes indicated with stripes in the picture below. Always pull forward while waiting. Do not stop in the center lane. The center lane is designated for continuous flow. Always stop for pedestrians crossing the crosswalk. We encourage you to arrive to pick-up your student after all buses have departed at 4:35PM. Once the buses have departed, you are welcome to enter campus on the main drive to safely and conveniently pick up your student. Another alternative is to wait in the parking area at the West Austin Youth Association (WAYA) fields. WAYA requests anyone using the entrance to their facility not park in such a way that impedes traffic flow in or out of their facility. Safety is their main concern. Take the yellow dog! AISD School Bus Finder. Carpooling with neighbors. Have you tried the Next Door app or Booster Club email lists? It works! Try the tagline: “Carpooling: Austin High School? Walking or Biking is an excellent way to stay fit and help the environment. The City of Austin and Austin High have provided a "Walk & Bike Map" outlining safe bike and sidewalk routes to Austin High School. Check out the B-cycle Stations. Take a City Bus! CapMetro Planner. CapMetro Routes. Walk the MoPac Bridge! for families traveling from South Austin, drop your child on the south side of the MoPac foot bridge. It’s a safe and scenic option.